The project features ten songs that Steve and his collaborators have been working on for the past few years between Iron Maiden tours and releases. With Kevin Shirley at the mixing helm – whose credits include Iron Maiden as well as Led Zeppelin, Journey and Rush among many others – this is an album to sink your teeth into. From the growling riffage of opening salvo “This Is My God” to the heavy forlorn balladry of follow-up “Lost Worlds” - which showcases Richard Taylor’s soaring vocals, it’s clear that “British Lion” is an altogether different beast from Maiden. 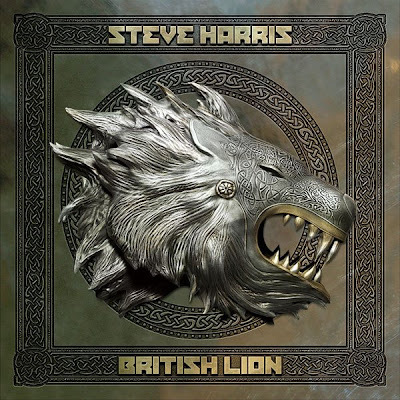 “Karma Killer,” with its dirge-like muscularity, and “Us Against The World,” with its massive chorus, demonstrates just how far “British Lion” has flexed Steve Harris’ considerable musical muscle. Dovetailed with guitarist David Hawkins’ positively gargantuan lyrical guitar melodies, it’s a mere hors d'oeuvre ahead of the epic, riffing-feast of “The Chosen Ones,” with its swaggering bravado. With Iron Maiden, Harris has become one of the most recognized and successful ambassadors for British music on the world stage. The group have released 15 studio albums, sold over 85 million records worldwide and played more than two thousand gigs in 58 countries in the band’s thirty-five year career. With “British Lion,” Steve steps out from Iron Maiden’s illustrious shadow to present a different side of his musical visions. The bassist is currently on the road with Maiden as they bring the band’s "Maiden England World Tour" to fans across North America this summer.